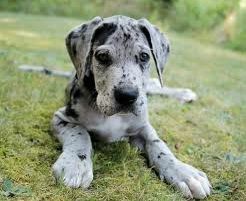 The Great Dane is a very old breed, known as the "Apollo of all dogs”. Dogs resembling the Great Dane have appeared on Greek money dating back to 36 B.C. There are also drawings of these dogs on Egyptian monuments from roughly 3000 B.C. The earliest writings of dogs that sounded like Great Danes were in Chinese literature dating back to 1121 B.C. 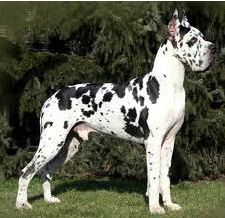 The Great Dane originated in Germany (407 A.D.), where they are known as the ‘Deutsche Dogge’. Breeds in his background are thought to include the Irish Wolfhound, from whom he gets his height, the Mastiff, who contributed heft, and the Greyhound, responsible for his sleek physique. Although they originated in Germany they spread throughout Europe and became popular in Denmark where they became known as ‘Great Danes’. "Great" meaning "large" and "Dane" meaning "from Denmark". Besides being used as a hunter, they were also used as estate guard dogs and some of their other talents include tracking, watchdog and carting. Great Danes have tall, powerful yet elegant frames. They have long, narrow heads with large nostrils and erect ears. Their eyes are dark, round and have an alert gaze. They have long necks, straight legs and chiseled bodies, medium-length tails and round feet. Their coats are thick, glossy, close fitting and can come in fawn, brindle, black, blue, harlequin (white with black patches),mantle and merle. The Great Dane has a good disposition, often called a "gentle giant". They are charming, affectionate, playful, reliable, trustworthy, dependable, courageous, loyal, dignified, lovable, easygoing, gentle, friendly, docile and peaceful. Although big in size this dog breed is never overtly aggressive - however they can have a stubborn side. Despite their large size they can do well in an apartment - as long as they get sufficient exercise. This is due to the fact that they are not very active dogs as well as their calm nature. Although puppyhood may be a challenge in an apartment and they will do best with at least a large yard. They make great pets for almost anyone but due to their size and strength they are not recommended for the elderly or families with small children. These dogs are very people-oriented and love nothing better than to hang around the house with the family. They are definitely indoor dogs and can become destructive if left alone for long periods of time. They are brave, loyal, devoted, and are often reserved towards strangers. They do not bark a lot but they will let you know of any danger and they only become aggressive when the circumstances require it. This along with their intimidating appearance makes them good guard- and watchdogs. They don’t need a huge amount of exercise and will be fine with a daily long walk, they can also be taken to dog parks where they will be able to romp around off lead. However it is important not to over exercise this breed, particularly when young. 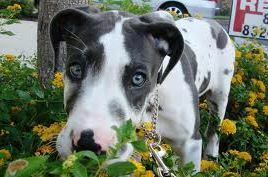 Great Dane puppies grow very large, very fast, which puts them at risk of joint and bone problems. If they don’t get the exercise they need they can develop obnoxious levels of barking, digging, counter surfing and other undesirable behaviors. One thing to keep in mind is that - even though they have gentle personalities - these are huge dogs. As puppies, they can knock over small tables and large children and as adults they can clear a coffee table with a swipe of a tail. They eat a huge amount of food and mess just as much. It can be quite a mission to get them to the vet if they are injured or ill and can’t walk by themselves. And to top it all they have a tendency to drool. Dont mind having a dog where its head it on par with your table and does not need to jump up! Only from reputable breeders! One can contact the Kennel Union Of South Africa (KUSA). They have a list of breeders who have puppies available or contact a KUSA affiliated breed club. Which other breeds are most compatible with the Great Dane? If well socialized they will get along with any other breed of dog. A good choice however will be another larger dog so they can play together without worrying that the one will get hurt, a larger active dog will be perfect like a Labrador, Golden Retriever, Setter, Pointer, Spaniel, etc. These big dogs can get along well with other dogs and non-canine pets, especially when they are raised with them. The friendly and playful nature of these dogs makes them excellent around children, they are very patient and loveable towards children but they must learn how to be gentle around them. A six-month-old Great Dane puppy will outweigh a six-year-old child and one swipe of that wagging tail will knock a toddler over. For this reason they are recommended for families with older children and it is important to supervise them if there re small children around. They are easy to train and do well in the competition ring. They are also quick to housetrain. Obedience training is very important with this breed, because they get so big, they must learn not to jump or lean on people and how to walk on lead. The best way to train them is by being patient, firm, confident, consistent and by using positive reinforcement techniques. They can become stubborn if harsh training techniques are used. The Great Dane has a short, thick, smooth coat. It sheds moderately but requires little grooming. Brush the Dane weekly with a rubber hound mitt or soft bristle brush to keep the hair and skin healthy. In spring and fall, he will have a heavy shed, known as “blowing out” the coat and will need to be brushed more frequently during that time to get rid of all the loose hair. Bath them only when necessary. As you groom, check for sores, rashes, or signs of infection such as redness, tenderness, or inflammation on the skin, in the ears, nose, mouth, and eyes, and on the feet. Ears should smell good, without too much wax or gunk inside, and eyes should be clear, with no redness or discharge. You also need to clean their teeth about once a week. Your careful weekly exam will help you spot potential health problems early. Like with most large breeds common health issues include hip dysplasia, bloat and congenital heart disease. They are also prone to hypothyroidism, Von Willebrand’s disease, cancer, tumors, hypertrophic osteodystrophy and neurological problems. they are prone to bloat, so two or three smaller meals throughout the day is the best option for feeding. It is important not to overfeed them as puppies since rapid growth can contribute to skeletal problems including arthritis. The average is around 9 years, however some can live to be 12-13 years old. 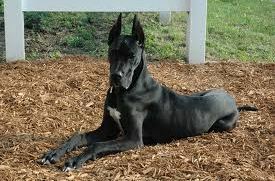 A black Great Dane named Zeus holds the record for the tallest dog (according Guinness World Records). He stands 112 cm at the shoulder, beating the previous holder - a blue Great Dane named George, who stood 110 cm at the shoulder. Fang, Hagrid's dog from the Harry Potter series is a Great Danes. Though in the movie the role was played by a Neapolitan Mastiff. English poet Alexander Pope (1688-1744) kept a Great Dane named Bounce. Pope, who was crippled, physically weak and subject to threats due to his frequent lampoons, never left his house without Bounce for protection. His dog was immortalized in his poem, "Bounce to Fop," a satirical address from his dog to the royal dog Fop, and also in the painting "Alexander Pope and His Dog, Bounce" (1718) by Jonathan Richardson. Manchester United goalkeeper Peter Schmeichel was nicknamed as "the Great Dane". The Great Dane was named the state dog of Pennsylvania in 1965. Scooby-Doo, the famous Hanna-Barbera character, was based on a Great Dane by animation designer Iwao Takamoto. Takamoto based his illustrations on sketches given to him by a Hanna-Barbera employee who bred this dog. The athletic teams of the University at Albany have been known as the Great Danes since 1965. Damien The Great Dane has been the mascot since that time. In 2003, the school added Lil' D, a smaller Great Dane, to help Damien entertain the crowds. Brutus in The Ugly Dachshund, a Great Dane raised by a Dachshund mother. Marmaduke is a newspaper comic strip drawn by Brad Anderson from 1954 to the present day. The strip revolves around the Winslow family and their Great Dane, Marmaduke. In each film version of Sir Arthur Conan Doyle's "The Hound of the Baskervilles", a Great Dane was cast as the cursed hellhound that kills the Baskerville family. Ace the Bat-Hound, from the Batman comic series, was depicted as a Great Dane mix. Do make this dog part of your family, the love company and need to be with their people.